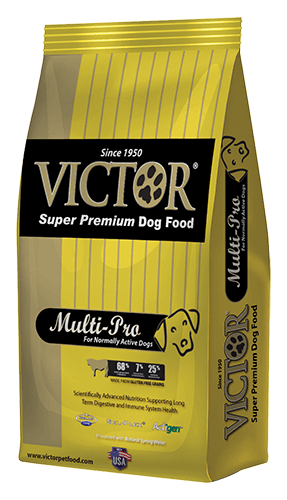 Since 1950, “Victor” has been a family owned and operated brand of pet food. 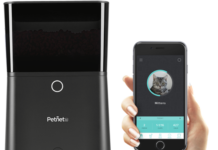 In 2007, the brand began to be manufactured under the name, “Mid America Pet Food.” The American company is based in Mount Pleasant, Texas, where all of their products are made and packaged at their “Mid America Pet Food LLC” facility. Their formulas are free from corn, wheat, soy and gluten. Besides not containing any processed grain by-products, most of their formulas do not contain any genetically modified (GMO) ingredients. All of Victor dog food products are made with only natural plant based preservatives. There are no artificially based colours, flavours, or preservatives added to their formulas. 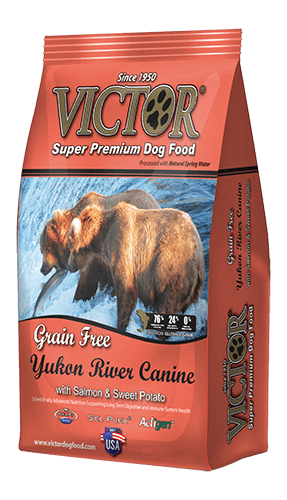 The Grain Free Yukon River Canine formula is an excellent choice for active dogs and puppies, as well as, lactating females. The primary ingredients are salmon, menhaden fish meal (source of DHA-Docosahexaenoic Acid), sweet potato, peas, canola oil, dehydrated alfalfa meal and flax seed (source of Omega 3 fatty acid). 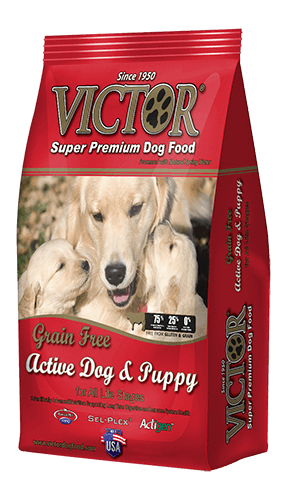 This formula provides well balanced nutrition for both active dogs and puppies. The primary ingredients are lamb meal, chicken fat (preserved with mixed Tocopherols), blood meal, menhaden fish meal (source of DHA-Docosahexaenoic Acid), dehydrated alfalfa meal, dried egg product, flax seed (source of Omega 3 Fatty Acid). 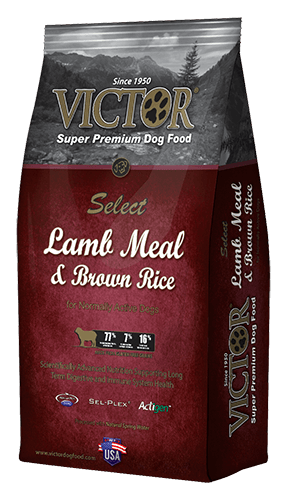 This formula provides carbohydrates that support a dog’s digestive and immune system at any age. The primary ingredients are chicken meal, peas, chicken fat (preserved with mixed Tocopherols), sweet potato, menhaden fish meal (source of DHA-Docosahexaenoic Acid), dehydrated alfalfa meal, dried egg product, flax seed (source of Omega 3 Fatty Acid). This high protein diet is highly recommended for dogs of all ages. The primary ingredients are chicken meal, beef meal, chicken fat (preserved with mixed Tocopherols), peas, blood meal, sweet potato, menhaden fish meal (source of DHA-Docosahexaenoic Acid), dehydrated alfalfa meal, dried egg product, flax seed (source of Omega 3 Fatty Acid). This nutritionally balanced formula is especially recommended for large breeds and highly active adult dogs. The primary ingredients are beef meal, sweet potato, chicken fat (preserved with mixed Tocopherols), menhaden fish meal (source of DHA-Docosahexaenoic Acid), pork meal, dehydrated alfalfa meal, dried egg product, flax seed (source of Omega 3 Fatty Acid and DHA). As the name suggests, this formula is ideal for both active dogs and puppies. The multiple additives work to support digestion and build a strong immune system. The primary ingredients are beef meal, sweet potato, chicken meal, peas, chicken fat (preserved with mixed Tocopherols), menhaden fish meal (source of DHA-Docosahexaenoic Acid), dehydrated alfalfa meal, dried egg product, flax seed (source of Omega 3 Fatty Acid). 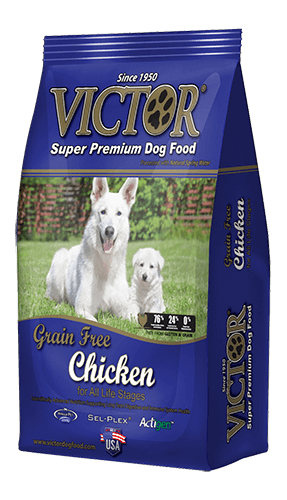 The Victor Select Ocean Fish formula is an excellent choice when dogs have allergies to a protein source from meat and poultry. The primary ingredients are menhaden fish meal (source of DHA-Docosahexaenoic Acid), whole grain brown rice, grain sorghum, salmon, peas, chicken fat (preserved with mixed Tocopherols), dehydrated alfalfa meal, flax seed (source of Omega 3 Fatty Acid). The primary ingredients are lamb meal, whole grain brown rice, whole grain millet, chicken fat (preserved with mixed Tocopherols), blood meal, dehydrated alfalfa meal, flax seed (source of Omega 3 Fatty Acid). 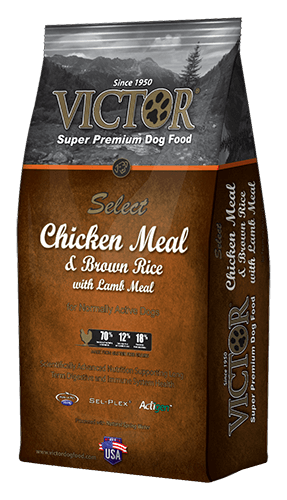 The Victor Select Chicken, Ocean Fish, Lamb, or Beef formulas are a great way to spice up a dog’s life, by offering different flavours throughout the year. They are ideal for dogs of all ages. The primary ingredients are chicken, chicken meal, whole grain brown rice, lamb meal, lamb meal, chicken fat (preserved with mixed Tocopherols), grain sorghum, dehydrated alfalfa meal, flax seed (source of Omega 3 Fatty Acid). This is an excellent nutritional choice for dogs in all life stages. The primary ingredients are beef meal, whole grain brown rice, whole grain millet, grain sorghum, pork meal, chicken fat (preserved with mixed Tocopherols), dehydrated alfalfa meal, flax seed (source of Omega 3 Fatty Acid). This is an excellent choice for senior and less active dogs, as well as, for a dog of any age that is in need of weight reduction. The primary ingredients are beef meal, whole grain brown rice, whole grain millet, menhaden fish meal (source of DHA-Docosahexaenoic Acid), chicken meal, chicken fat (preserved with mixed Tocopherols), pork meal, peas, dehydrated alfalfa meal, flax seed (source of Omega 3 Fatty Acid). This high protein low food is an excellent choice for dogs with moderate to high levels of daily activity. It is rich in carbohydrates, which helps to increase their stamina. The primary ingredients are chicken meal, beef meal, whole grain millet, blood meal, chicken fat (preserved with mixed Tocopherols), menhaden fish meal (source of DHA-Docosahexaenoic Acid), pork meal, dehydrated alfalfa meal, flax seed (source of Omega 3 Fatty Acid). This is an excellent choice for pregnant and lactating females, as well as, puppies. The primary ingredients are beef meal, grain sorghum, chicken meal, chicken fat (preserved with mixed Tocopherols), pork meal, menhaden fish meal (source of DHA-Docosahexaenoic Acid), whole grain millet, dehydrated alfalfa meal, flax seed (source of Omega 3 Fatty Acid). Fortified with high levels of both glucosamine and chondroitin, this food is an excellent choice for large breed dogs susceptible to joint issues in later life. These additives work to support healthy joint cartilage. The primary ingredients are beef meal, grain sorghum, chicken meal, chicken fat (preserved with mixed Tocopherols), whole grain millet, pork meal, dehydrated alfalfa meal, flax seed (source of Omega 3 Fatty Acid). This formula works perfectly for lactating females, puppies, growing and highly active dogs. 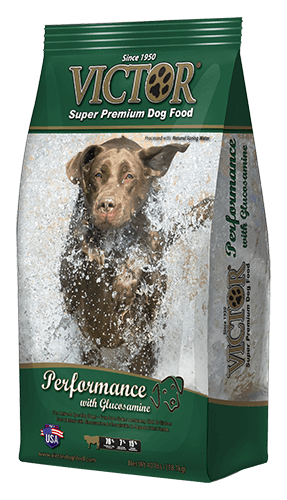 Victor High Energy formula is an excellent choice for highly active sporting dogs. This formula contains added vitamins and minerals and other additives that work together to support a strong immune and digestive system. The primary ingredients are grain sorghum, beef meal, chicken fat (preserved with mixed Tocopherols), pork meal, chicken meal, dehydrated alfalfa meal, flax seed (source of Omega 3 Fatty Acid). 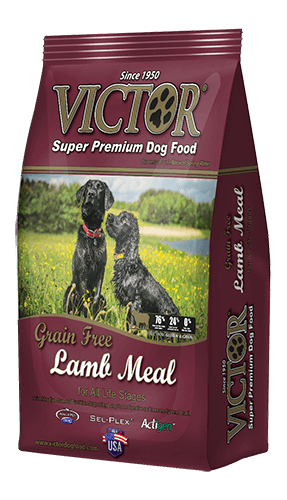 According to the Food and Drug Administration (FDA) recall database there have been no recalls of Victor dog food products. This is reassuring to the consumer, as they can feel confident that their pet is receiving high quality food. According to the contents of the various formulas, it appears that the grain free formulas rank the highest in nutritional value. 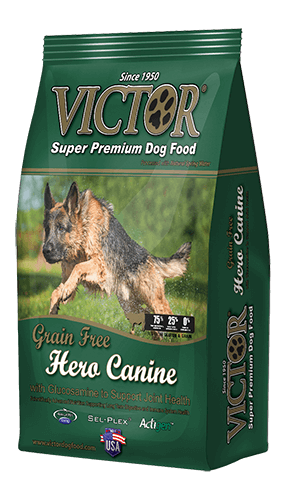 Victor grain free formulas are an excellent choice for dogs that may be allergic to grains, glutens, or other ingredients. Their meat-based ingredients contain large amounts of fresh beef, chicken, and ocean fish without any grain additives, which offers your dog a diet that is as close as possible to what they would consume in the wild. 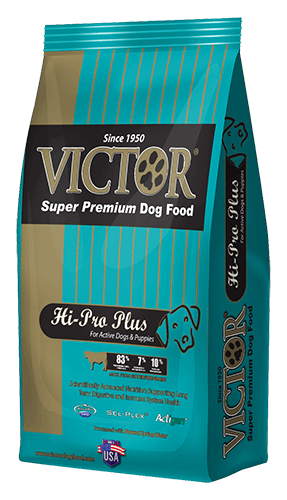 Victor Dog Food is a plant-based kibble that contains wholesome meat, chicken, or fish, and only a moderate amount of meat meals. This makes it a healthier choice than foods that contain large amounts of meat meal fillers. Even though some formulas contain grain additives, the sources are from healthy grains and not from wheat, therefore, also making them a nutritious choice. All Victor dry dog food products contain ocean fish, which provides high levels of the much desired Omega 3 fatty acids. The only issue that is disconcerting is that Victor does not have a statement on their website from the Association of American Feed Control Officials (AAFCO). This American nonprofit association endeavours to protect the consumer through labelling, ingredient and nutritional requirements. Any dog food manufacturer that wants to make the claim that their food is ‘nutritionally complete’ must meet AAFCO’s nutritional and feeding trial requirements. It would be to the benefit of both Victor and the consumer if an official statement from AAFCO was posted on their website. 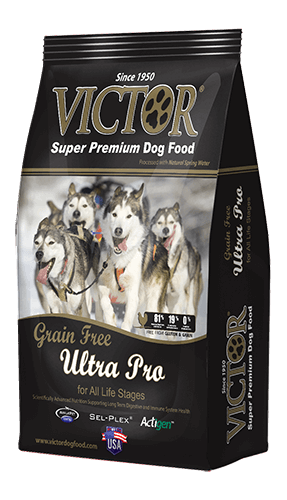 Overall, Victor dog food formulas appear to be a healthy choice to maintain optimum health of your canine friend. Find out what your dog needs the most and choose the most appropriate formula, according to their requirements.